Have you dreamed about working on political campaigns, running for office, teaching college courses, or pursuing a law degree? Earning an online political science master's degree can position you for exciting careers in the fields of politics, business, law, and education. Regardless of your background or undergraduate training, a master's degree in this social science qualifies you for many lucrative positions in several prominent areas. The median annual wage for political scientists in 2017 was $115,110, and the Bureau of Labor Statistics projects the number of political scientists in the U.S. to increase by 3% between 2016 and 2026. Professionals who earn an online political science master's degree can secure jobs with political organizations, labor unions, and lobbying firms that rely on their expertise in legal issues and relevant government policies. To increase their competitiveness on the job market, many professionals in this field pursue internships and volunteer work after completing their degrees. These entry-level positions help master's degree holders improve their professional network and locate appealing careers. Many graduates move on to work as political analysts, college and university professors, journalists, and digital marketing strategists. The Bureau of Labor Statistics (BLS) projects strong competition for political scientists, with salary potential remaining high. The median annual wage for political scientists is $115,110, with the top 10% earning more than $161,890 per year. These figures rank political scientist among the 20 highest paying occupations in the United States. What is a Master's in Political Science Degree? What Can You Do With a Master's Degree in Political Science? 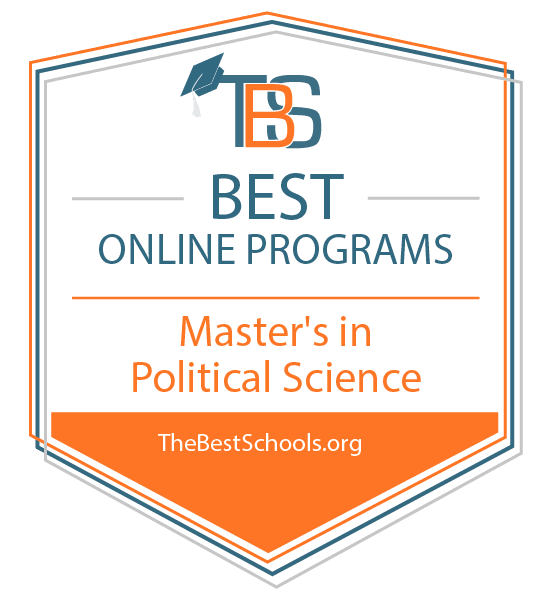 What Are the Best Online Master’s in Political Science Programs? Virginia Polytechnic Institute and State University ranks #1 on The five Best Online Master’s in Political Science Degree Programs! Based in Blacksburg, Virginia Tech remains one of the state’s flagship universities. Though the school focuses primarily on research and technology, Virginia Tech also offers many of its undergraduate and graduate programs online through its virtual campus. The school’s online political science master’s degree caters to distance learners, enrolling 67–70 online students and 10–15 on-campus students each year. Offering online courses since 1995, Virginia Tech allows students to complete all coursework in the political science program asynchronously. Students can complete the 30-credit program in four semesters by taking three courses each term. Foundational courses include research methods and contemporary political theory. Each student must also complete and defend a thesis. Most online students opt for a part-time course of study, taking one course per semester and earning their degrees in eight semesters. The political science program offers flexibility in elective course options. These courses can include global conflicts, transnational migration, and the politics of developing areas. Students who still need to complete an undergraduate degree can pursue an accelerated bachelor’s/master’s program. Out-of-state online students pay a higher tuition rate than in-state students. Applicants must have earned a minimum undergraduate GPA of 3.0 and submit GRE scores. Students can apply for admission to one of four start dates throughout the year. Virginia Tech is regionally accredited by the Southern Association of Colleges and Schools Commission on Colleges (SACSCC). University of Illinois at Springfield ranks #2 on The five Best Online Master’s in Political Science Degree Programs! The newest member of the University of Illinois system, UIS offers many of its programs online. The school’s online master’s in political science aims for convenience above all, never requiring students to attend on-campus courses in Springfield. That flexibility extends to the program’s coursework. The curriculum caters to students from various academic backgrounds, including students who want to teach, work in politics, or continue on toward an advanced degree. Online students can choose a concentration in public law, comparative politics and international relations, or American national and state politics. UIS delivers online courses both synchronously and asynchronously through Blackboard. However, since most of UIS’s students also work full time, most of the school’s online programs record professors' live lectures and allow students to view them at their convenience. The political science program’s 40-credit curriculum includes core studies, such as methods of inquiry and introduction to the graduate study of politics. All students must also complete an internship and a closure exercise, in which students choose between a case study, a comprehensive examination, or a thesis. Each student receives an initial adviser and eventually chooses a permanent academic adviser from the political science department’s tenure-track faculty. All applicants must hold a bachelor’s degree, proof of background in a related field, and a GPA of at least 3.0. Students who do not meet these requirements can apply for conditional admission. Students who have not completed a statistics course must do so at UIS. Sam Houston State University ranks #3 on The five Best Online Master’s in Political Science Degree Programs! Based in Huntsville, Texas, SHSU is one of the oldest universities in the Lone Star State. SHSU also holds membership in the Texas State University System and currently enrolls over 20,000 students, many of whom take courses online. SHSU’s online master’s degree in political science offers strong distance learning courses that cater to both recent college graduates and professionals working in political science. Graduates of the program teach in high schools and community colleges, find work in the nonprofit or public sectors, or continue on to further studies in political science or law. The program’s curriculum consists of 30 (thesis option) to 36 (non-thesis option) credits, and students never have to visit campus in Huntsville for any reason. Required courses including American politics, comparative politics, and international politics. Students choose elective courses to complete their remaining credits. The program accepts students for fall, spring, and summer start dates. Out-of-state online graduate students pay a slightly higher tuition rate than in-state residents. All prospective students must have an undergraduate GPA of at least 3.0 and submit GRE scores. Applicants must also include an academic or professional writing sample and two letters of recommendation. SHSU is regionally accredited by the Southern Association of Colleges and Schools Commission on Colleges (SACSCC). The University of West Florida ranks among The five Best Online Master’s in Political Science Degree Programs! Based on the Florida Panhandle in Pensacola, UWF’s campus sits on a nature preserve, bordering a bay and two rivers. However, distance learners never need to visit campus to earn their political science master’s online at UWF. Students in the program choose between specializations in political science (generalist) or security and diplomacy. With either path, the 33-semester hour curriculum includes a distinct focus on public policy, international relations, and comparative politics. The curriculum includes six core courses, including seminars in comparative politics, international relations, political theory, and American politics. Students must earn at least a “B” in five of the six core courses to continue in the program. Once students meet the core course requirement, they choose between a thesis or a comprehensive examination as a concluding experience. Students enrolled in the generalist specialization have free choice in their electives, while students enrolled in the security and diplomacy specialization must complete relevant coursework. UWF delivers all program coursework synchronously. Students who do not live in Santa Rosa and Escambia counties may apply to the online version of the program. The program does not operate in every state, so prospective students should check UWF’s state authorization page before applying. Applicants must have a minimum undergraduate GPA of 3.0 and submit GRE or MAT scores in the 50th percentile or higher. UWF is regionally accredited by the Southern Association of Colleges and Schools Commission on Colleges (SACSCC). University of Nebraska at Omaha ranks among The five Best Online Master’s in Political Science Degree Programs! Based in Omaha, UNO is the metropolitan branch of the University of Nebraska system. UNO caters to distance learners nationwide, including students earning a master’s in political science online. The 30-credit, interdisciplinary program allows students to take up to 12 credits in other fields, such as communications, social work, and economics. The curriculum consists primarily of seminars, offering content seminars in areas like U.S. foreign policy, international relations, American government, political theory, and political science methodology. Students choose between a capstone project or a thesis as a concluding experience. UNO delivers all program coursework asynchronously. Students can choose an optional concentration in international affairs or optional certificates in global information operations or intelligence and national security. UNO graduates work in diverse fields, such as law, academia, journalism, education, government, and the nonprofit sector. All students in the program gain access to one-on-one academic advising and online library services. As a proud member of the University of Nebraska system, students with in-state residency pay a lower tuition rate than out-of-state residents. All applicants must have already earned a bachelor’s degree with at least 15 hours of political science courses (including statistical methods) with a GPA of at least 3.0. Students are not required to submit standardized test scores. The program accepts students for the fall, spring, and summer terms. UNO is regionally accredited by the Higher Learning Commission (HLC). Students pursuing an online master's in political science degree engage in the systematic study of politics, political behavior, conflict, and government. Learners read historical and modern academic sources to explore political ideologies, diplomacy, and governing institutions. Upon completing this degree, graduates can seek employment in several prominent fields, including business, law, education, and politics. While public policy is also a popular field of study for those interested in these topics, it is considered a subfield of political science. This subfield focuses more on decision-making and the resulting outcomes in a variety of areas, including agriculture, education, and national defense. Distance learners in political science focus more on how governing bodies and policies work, as well as their effects on societies and communities. Online degrees can provide distance learners with several advantages over traditional on-campus programs. In many cases, online programs appeal to students with especially busy schedules. Asynchronous formats and self-paced learning may be ideal for working professionals and parents, allowing degree seekers to complete homework and course requirements at their own pace. Alternatively, synchronous formats and cohort learning provide distance learners with a more traditional classroom feeling of working alongside others; in these scenarios, learners keep a regular schedule and meet predetermined deadlines with other online students. They often interact and collaborate with others through discussion boards, chat rooms, and various online learning tools. Both synchronous and asynchronous learning formats can save you time and money. Online degree seekers have the convenience of studying from home, avoiding commutes to campus, parking fees, and other miscellaneous expenses. However, online learners must be self-motivated, enthusiastic students who possess the self-control to stay on task and meet deadlines. Earning a master's degree in political science online can help you land an appealing career in the field. While individuals with bachelor's degrees can work as legislative assistants, public relations specialists, and marketing research analysts, a master's degree opens the door to positions with more responsibilities and higher pay. A graduate degree trains learners to conduct valuable research and understand national politics, international relations, and political theory. As a result, these professionals can work as postsecondary professors, research analysts, political campaign managers, lobbyists, and more. For some careers, degree seekers may also elect to earn a Ph.D. in political science. In most cases, doctoral degree holders go on to teach and conduct research at colleges and universities. They may also seek positions in higher education administration or research-intensive positions with the federal government or private institutions. If you do not foresee a future in research or top-tier college teaching, an on-campus or online political science master's degree may be sufficient for your career aspirations. The following section explores some popular careers for those with a master's degree in political science, as well as their earning potentials. Professionals who earn an online political science master's degree can choose from a variety of exciting careers in the field. From hands-on jobs in politics and government to teaching and practicing law, degree holders can find a position that suits their personality and goals. Professionals with political science degrees should be motivated researchers and active learners, and they generally possess excellent networking, writing, and public speaking skills. They are also deeply collaborative and work well in teams. Political science programs provide students many transferable skills that can be leveraged in other in-demand fields. Policy Analyst: These professionals work for governmental or nongovernmental organizations, carefully track political developments and news that may affect their area of the field. They conduct research, analyze data, and present their findings for consumption by writers, journalists, politicians, or the public. Research Assistant Professor: These political scientists work for colleges and universities as professors and researchers. They may assume research roles with limited teaching responsibilities or assume heavy course loads, as needed. Marketing Research Analyst: Analysts interpret information from data reports, work in teams to develop strategies, and maximize the strength of their companies or organizations. They must stay current on trends in marketing, database analysis, and related computer software. Attorney: Before enrolling in law school, some students acquire an online master's degree in political science. After earning their law degree, attorneys provide counsel for clients in various types of businesses and legal situations. Attorneys may work independently, for large corporations, or for government entities. Social Media Manager: Since social media increasingly shapes public opinion, many political science majors pursue careers in this area. These workers communicate with customers or constituents, develop media strategies, and generate online content. They may lead marketing teams or designers to help an organization carry out branded social media campaigns. It is important to take your time when researching schools -- most master's students commit thousands of dollars and multiple years pursuing their degree. Give yourself at least three months to research schools to determine the best academic and financial options for your needs. In many cases, in-state public schools offer the most affordable options. However, some online programs charge the same tuition rates for all distance learners, regardless of their location. Programs may also offer different specialty areas, which can help learners better achieve their target career aspirations. There are many options, but if you take the time to conduct an extensive search you should be able to find an online political science master's degree that matches your academic and career goals. Program Cost: Students with financial concerns should review a program's distance learning costs. While in-state tuition at public institutions is often the most affordable option, these numbers vary between states and you may find comparable rates for out-of-state learners elsewhere. School's websites also usually include financial aid and scholarship information. Transfer Policies: Some schools boast generous transfer policies, allowing students to transfer in several applicable credits. Along with cost, this should be one of the main considerations for transfer students. If prospective transfer credits come from an accredited school and align with the curriculum, applying transferable credits can reduce your future course load and save you money. School Size and Type: Distance learners who wish to take online classes with fewer students may want to search for political science programs offered at private schools. While this is not always the case, public schools tend to have larger class sizes or multiple sections of one course. Private schools, on the other hand, may only have one section with fewer students. This is especially true for degree seekers in cohort-based learning programs. Program Length: An online master's in political science program takes most full-time students about two years to finish. Part-time students can expect to spend considerably longer completing classes and finishing graduation requirements. Depending on your availability and the number of courses you take each term, part-time students may spend 3-4 years earning a master's degree. On-Campus Requirements: Online programs with a hybrid component require students to attend one or more classes in a classroom. These classes may not always be on a school's main campus -- some offer courses at satellite campuses or other designated locations. While many of the best political science programs do not have on-campus obligations, some learners may enjoy this in-person option, which may allow them to better connect with faculty and peers. Thesis, Fellowship, and Work Requirements: Some schools require students to complete capstone projects during a directed/independent study course. Alternatively, other programs may ask distance learners to complete a traditional master's thesis based on original research. Accreditation is a voluntary peer evaluation process that proves schools meet or exceed certain standards of quality. In addition to ensuring that students will receive a quality education, accreditation can impact the transferability of earned credits and a student's eligibility for federal financial aid. Additionally, many employers require candidates to hold degrees from accredited institutions; therefore, students should make sure to only consider schools that hold proper accreditation. There are two types of institutional accreditation: regional and national. Regional accreditation is the older and more highly regarded of the two. Several regional accrediting bodies award accreditation to nonprofit, degree-granting institutions based on their location. Alternatively, for-profit or vocational schools often receive national accreditation. The U.S. Department of Education (ED) recognizes all regional accreditors, but may not recognize all national accreditors. To qualify for federal financial aid, students must attend a school with accreditation from an ED-recognized accreditor. Students can search the ED's database of accredited postsecondary institutions and programs. How Long Does It Take to Complete an Online Master's in Political Science Degree Program? Most students pursuing a master's in political science online need to complete 36-45 credits to graduate. Full-time learners can earn their degrees in two years or less. Alternatively, part-time learners can expect to graduate in 3-4 years, depending on their availability. Some programs also offer accelerated tracks or allow degree seekers to take a heavier course loads, allowing participants to finish more quickly. Additionally, while not all schools offer this type of flexibility, distance learners in some programs can transition between attending on a full-time or part-time basis between terms. Some schools charge full-time students a blanket tuition, no matter how many credits they take. Therefore, learners taking more than the average number of credits each term may be able to save on costs. Alternatively, many programs charge distance learners by the credit, regardless of how many classes they take. In this case, enrolling in a heavier course load may not be worth it. Students pursuing a master's in political science online can often add a concentration to their degree. This concentration determines some of the required courses or electives required for graduation. Concentration areas vary between schools, so make sure you research these offerings carefully. Your concentration can better prepare you for specific careers in political science. This concentration focuses on the study of political behavior and political institutions in the United States. Students investigate the overlap between ordinary citizens and political institutions. Learners also explore research methods commonly used when studying a democratic society, including qualitative methods, survey research, interviewing, and observational data. Learners in this concentration focus on conflicts between countries, political economy law, subnational politics, and lobbying. Professionals use empirical and statistical approaches to study politics, and many compare foreign policies with those found in the United States. Students typically develop a secondary specialty area based on a geographic location, such as politics in Latin America, East Asia, Europe, or Africa. Students pursuing this concentration study economics and international relations. Coursework features an interdisciplinary approach to exploring globalization, trade, finance, political risk, and the balance of power between governing entities. A socially centered division of political science, students in this area of the field analyze significant amounts of economic data and statistics to evaluate current and upcoming policies. Learners in this area develop practical skills and a solid academic foundation, preparing to assume leadership positions in the government or for nonprofit organizations. Students focus on topics such as political writing, data analysis, party politics and voting, and legislative organization. Many master's students in this area move on to pursue degrees in business or law. Master's students with a concentration in political theory study moral philosophy, legal theory, social science, and history. Learners focus on dominant controversies related to justice, human rights and liberties, and governmental protections for minorities in majoritarian democracies. By examining the relationships between political ideas and political practice, learners prepare for many careers in politics and related fields. Students earning a master’s in political science online receive advanced training in political science theory, research, and methodology. An online political science master’s degree is interdisciplinary in its scope and covers many other areas, such as sociology, law, and economics. Required classes vary by school, but the courses listed below represent common offerings in many political science programs. This course typically covers specific periods of political thought, from ancient Greece to medieval Europe. Learners study major political theorists and explore similarities between the past and present. Political scientists and professionals in public policy draw on the comprehensive understanding of political thought and theory this course provides. This course presents the essential tools that political scientists, survey takers, data analysts, and researchers use in formal and quantitative work. Students explore the mathematics of political science and study topics including linear algebra; statistics; probability; limits; functions; continuity; and other concepts central to mathematical models, such as game theory and econometrics. Seminars examine a specific aspect of U.S. politics, such as political institutions, the political party system, political behavior, or economic inequality. Seminars challenge students to think critically about major questions related to the topic and to reach logical conclusions. Students develop their conceptual literacy to engage with international political issues and topics, including realist and feminist approaches. Degree seekers cover pertinent issues related to international politics, including political violence, religion, human rights, and international law. This course provides an in-depth analysis of modern and historical theories throughout Western history. Learners examine the connections between rhetoric and democracy, art and power, major theoretical trends in the U.S. and abroad, and how to further the scholarly discipline of politics through academic research and persuasive writing. CPS Certification: For more than 20 years, the Academy of Certified Political Analysts has promoted graduate standards for certification in politics and political analysis. Individuals seeking this certification must hold an accredited advanced degree in politics (such as a master’s degree in political science) with at least 18 credits of political science and legal courses. Additionally, individuals must have graduated with a minimum 2.5 GPA and have at least two years of political, governmental, or public service experience. Political Science Endorsement: Prospective educators must hold at least a bachelor’s degree to earn this endorsement. However, to teach American history or political science at the secondary level, educators should also hold an advanced degree, such as a master’s degree in political science. Professional organizations advocate for workers in a specific field or discipline. Membership in these types of organizations can help experienced professionals advance their careers through networking and professional development opportunities. These associations also provide information and resources for current students and recent graduates, such as job boards, professional contacts, and scholarship opportunities. American Political Science Association: Founded in 1903, APSA serves more than 12,000 members and cultivates a deeper understanding of politics, democracy, and citizenship. Members gain access to political science scholarships and a variety of programs and services for individuals, departments, and institutions. International Political Science Association: Founded in 1949 under UNESCO, ISPA is an international scholarly association devoted to the global advancement of political science. The association strives to create an accessible, worldwide community for political science professionals. Association for Political Theory: Since 2000, APT has promoted the study of political theory and philosophy in North America. The organization advances scholarly interaction among political theorists, educators, and researchers. APT also hosts an annual conference on political thought. Western Political Science Association: WPSA is an association of more than 1,250 political scientists that was founded in 1948. The association promotes the study and teaching of politics, while also inspiring research and collaboration among its members. Members can take advantage of WPSA's annual conferences, professional development workshops, and job board. National Conference of Black Political Scientists: NCOBPS promotes the political aspirations of people of African descent in the United States. Founded in 1969, the organization boasts over 400 active members and hosts an annual meeting. NCOBPS provides an active job board, access to scholarships, and online journal access for members.